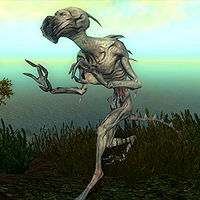 Hungers are thin skinned Daedra, almost anorexic looking. They have a long tongue, sticking out of an always open round mouth. They were previously seen in Morrowind. Five standard varieties of the Hunger can be found in the Shivering Isles. The name prefixes used to distinguish these varieties are a play on the word hunger. In combat, Hungers rely on a physical attack and their Absorb Fatigue spell. Strangely enough, they appear to be the minions of Boethiah, even though they are found in Sheogorath's realm. These Hungers will appear with their corresponding Summon spells. The only place to purchase these spells is from Earil in Crucible. This variety can only be found in Xaselm. If you are wearing the Heretic robes and hood the hungers might not attack you. Due to the Heretic Faction having a 100+ disposition towards hungers and if you wear the robes and hood you are effectively joining that faction. The hungers will sometimes recognize you as a non-heretic and attack you on sight.